This season saw the first edition of a league dedicated solely to central England, with the rebirth in footy in the cities of Liverpool and Birmingham, and the creation of the first-ever sides from Leeds and Huddersfield. These four sides, freshly-formed and built almost entirely from local recruits who have learnt the game from scratch, recently completed the inaugural ARUK Central home and away season, with the Huddersfield Rams finishing clear top of the table. Fighting for the right to face the Rams in the Grand Final on August 16th, the Birmingham Bears and Liverpool Eagles will this weekend face off. 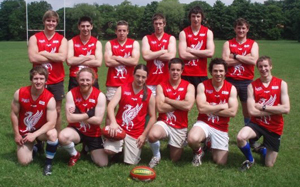 The Liverpool and Birmingham Australian Rules clubs took some time out from preparing for the preliminary to tell WFN a bit more about their respective first-up seasons. When the Birmingham Bears ran onto the ground for round one this year, they were the first Australian Rules team from Brum to play a regular season game since the Birmingham Crows played a season in the BARFL back in the early nineties. Bears founder Mat Mitchell is very happy with the development of the Bears on the pitch this season, with a side featuring only one Australian. "Literally everyone else is a newcomer to the sport, yet have picked up the skills very quickly. In-built things like ‘soccering’ it off the floor instead of picking the ball up have disappeared over the course of the season as people have got more confident with ball in hand." "From a ladder point of view, we’re doing very well, locked in to finish second and only losing to an organised Huddersfield side. Even then, we’ve kept the scores respectable compared to the thrashings the Rams have given to other teams, plus it’s us not them that’s going to have a player winning the goal kicking award, with our lone Aussie Chris Kimmett well ahead on 36 goals." Off the field however, it's been a lot harder, with the main obstacle being the travel required. This year's ARUK Central league is a combination of the Central and North West divisions that had been originally planned, after neither ground had the number of teams ready to take the pitch that had been hoped for by organisers. 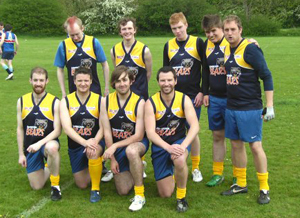 Furthermore, the Sheffield Thunder were only able to play a few matches, due to logisitical issues. The area's two oldest teams, the Nottingham Scorpions and Manchester Mosquitoes, elected to continue in the AFL London's third division. The Bears ended up as the only team in the Midlands, and had to travel as far as Huddersfield for away games, around 4 hours by car. As Mitchell explains, "It’s hard convincing people completely new to the sport that it’s a good idea to go to drive up to Yorkshire most weekends for a game. The core group of six or seven of us that’s emerged are either those I’ve introduced to the game beforehand, or those who have been out to Australia and fallen in love with the sport off their own back. We’ve managed to get new people down to training or had people get interested only to go quiet when finding out about availability for the weekend." Mitchell does however stress that he has been happy with the overall league structure. "We knew it was a stop-gap until hopefully next season when the Midlands will have more teams going. I’m definitely glad to have been playing, rather than sitting around for another year trying to entice people to play without any games to enjoy." Plans for next season are largely to attempt expand the player base over the winter, including the creation of a new side linked with the Bears - the Birmingham University Sharks. Heading this project is current Bears player Tim Smith, who is aiming to structure the club both as a stand-alone entity and also as a recruiting tool for the Bears. Mitchell says, "The view is to have the clubs as two separate entities, but very closely linked, with the options of training together, games between the two sides as well as generally increasing the publicity of the game around our city." Also starting up in the greater Birmingham area are the Wolverhampton Wolverines, run by Ian Mitchell (no relation) who has also played for the Bears this season. While Mat Mitchell and the other Bears will be sorry to see him leave, they are looking forward to having a local rival. Says Mat Mitchell, "because we’ve built up a friendship over the season, the clubs will be closely linked, similar to the Uni team. Essentially it’ll be much easier to play anything over the winter if you only have to go 30 minutes rather than somewhere 2 hours away." Other cities in the local area have what Mitchell calls 'placeholder' clubs, meaning that ARUK has a name for a side ready to go in a number of towns, as part of a wider project to have a club in every town with a Walkabout - a chain of Aussie pubs who sponsor the ARUK National League. Mitchell says "In theory, teams like Leicester and Derby should get off the ground, but Leicester have been trying for a while and I have doubts." "There’s supposed to be local clubs in Oxford, Coventry, Gloucester and Stoke as well to get off the ground, but as yet I’ve not seen anybody take up the challenge of starting a club from scratch. It’s hard work to begin with, but having got through our first season without too much trouble, we’ll have no problems equalling the Crows team of the 90s by turning up for a second season." Further north in Liverpool, the Eagles recently signed an affiliation with the AFL club West Coast and Chris Thompson and Matt Farrell from the club's leadership are very happy with how their first full season has progressed. Thompson tells us they have developed a good core of Liverpool-based players, although there have been a few challenges in getting the side onto the pitch, including finding a permanent homeground. "I would have liked the Eagles to develop further as a club securing a permanent ground and a greater social aspect within the club. This has been hard along with organising games and players but is looking promising for 2010 season, especially with Matt Farrell's input." "Next season we are looking to have a massive start to the season with a few training sessions, inviting the local rugby clubs along. Along with the player drive, we have had a good response from several clubs regarding affiliation and permanent grounds." As with the Birmingham Bears, Thompson sees the travel distances between clubs as a major hurdle. "With no support for travel costs this is a hard issue. Although with the league becoming more established, fixtures will become more fixed and there will be less confusion with changed dates and times. With the second season in 2010 the kinks should have been worked out and it will run smoother." Brum beat the Eagles and will take on Huddersfield next weekend - details to come. In other English footy news, the AFL London Grand Final is on August 22. In the ARUK Southern, Chippenham won the premiership over Bournemouth last weekend.